Cannafit.club is an easy to use, web based guide that helps anyone plan and track their meals, exercise and THC/CBD dosing. Really. We’ve heard it referred to as the Fitbit of cannabis and we don’t mind that at all. Cannafit can be accessed on any internet enabled device and is for the average American who either requires a special diet or would like to drop some weight and get in shape the right way, through a clean diet and exercise. It is hard to change your lifestyle and at Cannafit we know that. Let us take the guesswork out of what you should eat to reach your weight loss goal by suggesting meals for you based upon your personal preferences. What inspired you to co-found Cannafit? As a Complex Decongestive Therapist for Lymphedema patients, I worked primarily with cancer survivors. I watched strong, beautiful women have to tape their fingernails on with bandaids. I watched theirs limbs swell with fluid after radiation and lymph node removal. Their fight for survival was incredible. After watching my grandmother lose her life to cancer, I swore that if faced with the choice, I would never poison my body with chemotherapy and radiation. I believe in cannabis as a cure for cancer. I also truly believe in whole, organic food as fuel and medicine for the body as a cancer preventative. It just makes sense to me to support the immune system not destroy it. I am not a doctor that is just my opinion. And my own personal experience with Cannabis has been nothing but positive. I prefer natural medicine and only take pharmaceuticals when absolutely necessary. I use it for both medicinal and recreational purposes. It truly depends on the day. The older I get the more I need it for PMS and insomnia and stress reduction. I am never hungover and it always instantly makes me feel better and happier. I am a fan!!! Why should someone choose to use Cannafit over other health and fitness trackers? Cannafit is not an app, so you don’t have to take up valuable storage space on your phone to use it. Cannafit integrates with Fitbit, Runkeeper and Withings to track your activity for you. Cannafit mindfully guides the individual to reach weight loss goals. For those with serious and chronic illness such as Epilepsy, Diabetes, Autism, etc. Cannafit is perfect for recording exactly what you ate, we even include all of the nutritional values for you and calculate calories burned through exercise. This data is easily shared with one’s physician in reports that are clear and easy to read. The dosage tracker helps you find the perfect dose and strain for your needs through accurate tracking of consumption and notation of how it affected you, that day, with that specific dose. No other health and fitness tracker has integrated an individual’s marijuana use as we want to provide that to anyone it could benefit. How do you think Cannafit will impact the legitimate cannabis industry and its customers? My hope for Cannafit that we can truly help people be healthier and therefore happier. We want to remind people to get back to basics and get healthy the natural way! 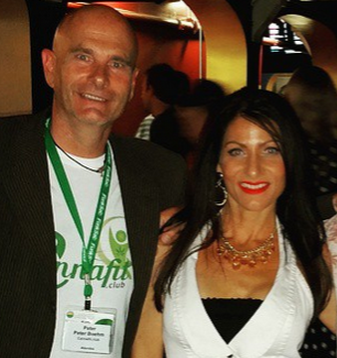 I want to see Cannafit grow to include social groups that can share ideas and success along with failures to support each other. We want to include more education tools and tele-medicine to further support individual users. I know that Cannafit will be a help in legitimizing Cannabis as a medicine. And I hope that Cannafit will help to change the false perception of the lazy stoner stereotype. Any words of wisdom for people just beginning to track their health, wellness and cannabis use? I want everyone to know that by using a tool like Cannafit, where they log and track their meals and activities, they have a 90% greater success rate than if they were to just wing it. It’s so easy to use and really empowers the individual to take control of their health for themselves and their well being. Take our poll and help us get a better understand of where you are at in your journey.